The compact Tacklife PCD02B 12V Lithium-Ion Cordless Drill/Driver has plenty of power in a small package. It's a complete system, with a carrying case, 8 driver bits, 8 drill bits, and 19 positions of adjustable torque for taking on all kinds of household drilling tasks. It's a convenient, versatile tool for managing tasks and repairs quickly and easily. Who is the Tacklife PCD02B 12V Lithium-Ion Cordless Drill/Driver for? What's included with the Tacklife PCD02B 12V Lithium-Ion Cordless Drill/Driver? The [amazon link="B0741XDV1Q" title="Tacklife PCD02B 12V Lithium-Ion Cordless Drill/Driver" /] is small and lightweight, but has great features and great performance. It has a 19-position adjustable torque setting and clutch. for torque up to 220”/lbs. with precise control. It has two speeds, up to 1,400 RPM, controlled with a variable speed switch. It also has an LED work light, and a comfortable, ergonomic grip. The 12 volt lithium-ion battery recharges quickly, with full power within an hour from the included charger. This drill comes with everything you need for a variety of drilling and driving jobs, including the battery and charger, heavy-duty carrying case, an extension bit, and 8 driver bits and 8 drill bits. This product is for people who need a lightweight, compact drill for household tasks and projects. It is especially good for assembling furniture, which often requires prolonged use in very short bursts, drilling at awkward angles or in small spaces, and can often benefit greatly from an onboard light because of the unusual when angles assembling furniture. Large, professional drills may not be able to access smaller spaces, are more expensive, and are more cumbersome to use and store. Even professionals find themselves reaching for the Tacklife PCD02B 12V Lithium-Ion Cordless Drill/Driver for quick jobs, because it is so lightweight, fast, and easy to use. This is not a tool for heavy-duty professional jobs, and will probably not stand up to years of rugged daily use. The motor isn't especially powerful, and will be less effective on tough materials. The biggest drawback of the Tacklife PCD02B cordless drill is that there isn't a second, backup battery available. The quick-charging feature is a good one, but it can still be frustrating to pause a project and wait for an hour for the battery to recharge before you can get back to work. ​As of March 2018, Tacklife says that a standalone battery is in development, but currently not available. Truthfully, that response doesn't quite make sense; surely if they can make the battery that comes with the drill, they can simply sell that battery alone and separately as a backup/standby battery? Max torque of 220 in./lbs. The chuck on the Tacklife PCD02B 12V Lithium-Ion Cordless Drill/Driver is likely to loosen over time with hard use. To extend the life of this handy little drill, it's best used on light-duty jobs that need more speed than power, and don't try to use it on very hard woods or masonry. Too many tough jobs will shorten the life span of this lightweight drill and driver. 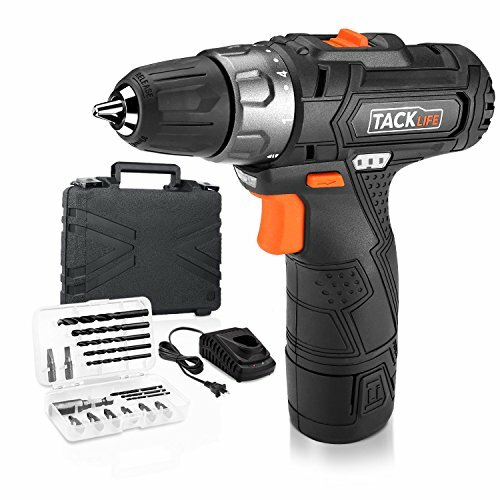 If you like the Tacklife PCD02B, but need more power and want the option of an additional battery, the [amazon link="B075D9JQXM" title="Tacklife PCD01B 12V 2.0Ah Lithium-Ion Cordless Drill Driver Set" /] is a great option. Like the PCD02B, the PCD01B has a 12 volt battery, variable speeds, a key-less chuck, LED work light, and 19 torque settings. It also charges in less than an hour with the included battery and charger, and has a heavy-duty carrying case. Unlike the Tacklife PCD02B, however, the PCD01B tops out at 1300 RPM, and only comes with 6 driver and 6 drill bits. Importantly, it has more torque, with a max of 239 in./lbs., and an all-metal chuck for more durability. And, critically, it has the option of an additional battery so you never have to stop working to recharge. The [amazon link="B075D9JQXM" title="Tacklife PCD01B 12V 2.0Ah Lithium-Ion Cordless Drill Driver Set" /] is comparably priced to the PCD02B, and is backed by the same 24-month warranty, but overcomes some of the durability and battery challenges of the PCD02B, so it's a good alternative choice for a slightly more useful drill/driver. The Tacklife PCD02B 12V Lithium-Ion Cordless Drill/Driver is compact and handy for a variety of small jobs around the house. It's small size, good speed, light weight, and comfort in use make it a great choice for quick, small drilling jobs that don't require a lot of power. The lack of a backup battery makes it not a great choice for tougher jobs that are longer in duration. For example, it might be annoying to be halfway through a project and have to stop entirely for an hour in order to recharge the battery, particularly for outdoor projects where the weather or light may change over time. However, for hanging shelves or pictures, assembling furniture, small repairs, and quickly daily needs, it is an excellent choice. It's a useful, fast, easy, and affordable compact drill and driver.